Well I cant speak for others but when I said random I didn't mean there was no pattern to how they were selected for allied and opposed just that the logic underlying such decision was suspect so to quote myself I do it like this. The main school should define which other schools get selected based on its mechanics. So Conjuration is summoning things that weren't present not modifying things that are already present. 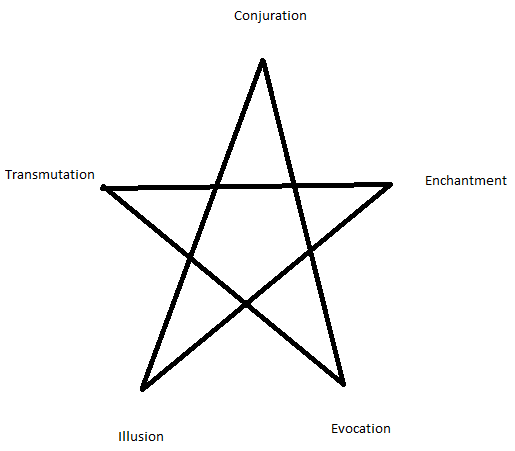 Ergo Conjuration gets Evocation and Illusion because it summons them much like creatures or items. The elements for evocations come from somewhere else as do the illusions. Transmutation and Enchantment are banned because they are about modifying things that already present. Be it matter or minds. 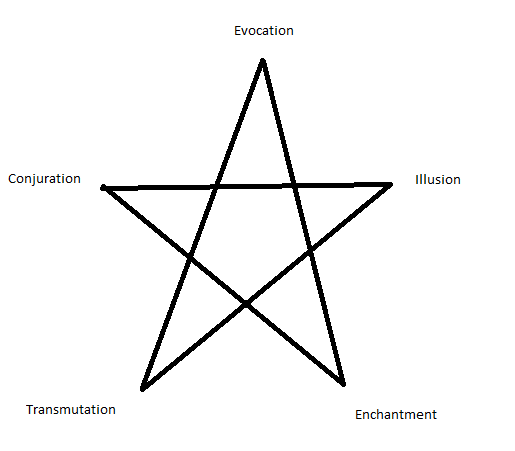 Evocation would get Conjuration and Transmutation because its about manipulating energy in this case to create items or creatures or to modify existing creatures. Energy is Matter after all. Whereas Illusions and Enchantment are banned because Illusions aren't actually anything physically and minds are more abstract as well. Edited by Skaddix, 24 October 2017 - 12:22 PM. Primarily I considered whether a school has more to do with affecting (transmutation, enchantment) or creating (evocation, conjuration, illusion). Beyond that, illusion is about creating nothing real, while transmutation and conjuration are about real matter. There are other justifications, but I think most can be inferred from what I've said and I don't want to make this TLDR. I think we basically agree in that the the Primary School should determine the Secondary Schools based on what it affects. Whereas with the current system I don't really think that is occurring at all. The wizard is going to need quite the power bonus and spell balance to make this worth it. The special ability is also going to have be really worth it and acquired early. Otherwise you are sacrificing a whole lot more then the Priest. We do, though I only thought about what schools should be opposed. You raise a good point. For example, a conjurer can use enchantment spells, though they couldn’t be more different. I agree that if there is a rhyme or reason to their chart, I don’t see it. Indeed maybe its for balance reasons. Since Illusion seems to have gotten most of the defensive abilities, I can see why stacking that with conjuration or transmutation might cause issue and recovery time increase probably wouldn't impact you much if you just need some buffs at the start of combat. And that makes a little more sense. Well, if there re any balance or utility or useability problems, they should get sorted out in the backer beta. I think Boeroer is among those going into the backer beta? In any case, I'm sure there are lots of people well experienced in RPG mechanics and stuff in it. You could easily flip the schools on that diagram to whatever arrangement and it would make just as much sense. That's what I meant by random. None of these schools oppose eachother thematically which would make losing access completely understandable. If Illusion and Enchantment are your favourite schools, you're simply out of luck because someone decided that should you specialize in one, you lose the other. The only way to get both Illusion and Enchantment is to pick Evoker subclass or not subclass at all. The system is just rigid and arbitrary. Getting a penalty to all spells outside your chosen school makes sense because of focus. But being completely unable to cast two entire schools of spells "just because" doesn't. In terms of discovered grimoire, having the ability to merge spells from various different grimoire into a single grimoire may help alleviate the concern over unusable spells for the wizard subclasses. How so grimoire is still restricted by your restricted schools? And yes if any schools go together it be Enchantment and Illusion since they are both screwing with other people's minds. That is correct. Even if grimoire you are holding contains a spell from a restricted school you sill won’t be able to cast it. Alteration is basically transmutation, and abjuration is basically the generic control of magical energy -- mostly buffs and removing buffs. To abjure means to formally reject or renounce, so perhaps the idea behind the name is magical barriers. Does this list make any more sense than POE2's? Edited by PugPug, 25 October 2017 - 12:23 PM. Is Abjuration-Alteration the two types that the spell school has or is Abjuration the spell school and Alteration is the group of spells that it can't use? Its the pair listing Abj gives up Alt...I think it fits pretty well. Illusions are about affecting minds....Necromancy is about affecting bodies. It certainly fits better then what we got plus you know they hade more schools overall and still only had to give up 1. Illusions are about externally affecting the senses (PER); enchantments are about internally affecting minds (INT/RES). Necromancy seems like a specialized form of Transmutation, or possibly conjuration. Edited by rjshae, 25 October 2017 - 05:27 PM. DnD 3.5 complicates it by having you give up two schools, but you can choose which, but you can’t pick Divination as one of them. On the other hand if you specialize in Divination, you only have to lose one other school. 3.5 has 8 schools plus the “universal” school that is totally uninvolved on this. So they lose 25% if the spell schools to our 40%. They can cast a spell from their school once more per day for each spell level (one more 1st level spell, one more 2nd level spell, etc.) and gain +2 to skill checks on the school, such as scribing scrolls. What they do not get are a separate special ability or a bonus to casting the spells. They don’t get a penalty to other spells ether, though. So special abilities must be pretty awesome. Perhaps it is that that we will use to decide our specialty, rather than our prohibited schools, as we have theorized. The AD&D "opposing schools" system was rubbish which is why it's weird they would want to replicate it in PoE2. At least in BG you only lose one school out of 8, so the current PoE system of axing 2/5 is actully much worse. Edited by 1varangian, 26 October 2017 - 07:07 AM. Divination in PoE is conspicuous by its absence, as is the lack of an invisibility spell. I guess they didn't want the Wizard to upstage sneaky characters?